It's time to get busy with projects that you have long put off! Speak up, and ask for help if you need it! In this case, badger symbolism, is a message for us to walk our path at our own pace. In other words, you must have faith in yourself and your abilities. Moreover, trust that you have all the right tools to take on whatever challenge faces you. Also, you should make sure that you ignore what others may say. Beaver Symbolism can also be a sign that it is time for us to come out of hiding. Consequently, there is no need to stay out of the limelight any longer. Badger meaning is telling you to let the world know you mean business! Also, the symbolism of this animal crossing your path can be letting you know that you need to stay grounded. For this reason, it is essential for you to stay in the present moment by keeping your feet planted on the ground. In effect, this will anchor you to what is meaningful in your life. In general, badger totem people will know how to stay grounded in all circumstances. 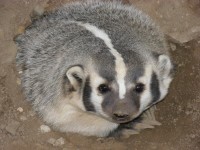 Also, folks with badger spirit animal totem are very territorial and unafraid of defending their boundaries. Consequently, they are very much aware of all the things that are important in their life. People with this totem take the time to nurture those around them while making sure that they also sustain their own needs. Determination and focus are comfortable for you, as is self-reliance. If this mammal is your spirit animal, you are never out of touch or confused because you know how to stay anchored to what is important to you. For the most part, you don’t care what others think of you and have no hesitation in warding off personal attacks and invasions of your space. This mammal is closely related to the Otter, the Weasel (coming soon) and the Wolverine (also coming soon). All three of these creatures should also be studied along with the Dachshund which is specifically bred to hunt and dig after badgers in order to chase them out of their burrows. In this case, your badger dream is a sign of good luck, particularly if you have been struggling with a significant hardship in your life. If this animal is aggressive in your vision, it signifies that a personal attack is coming toward you from someone close to you. In this case, their efforts to change you may not be what is right for you. If this animal is dead in your dream, then you have failed to set a boundary correctly, and someone has walked all over you. Alternatively, the dream may be foretelling that a new project that you have undertaken will be much more challenging to complete than you expected. If the animal is all white, it signifies a period of purification and growth. Nurturing yourself through this transition is crucial. Therefore, make sure that you retreat and go to ground for a while. I’m very fond of Badger, Tsisheró:hen for her courage and massive heart. I once watched a Badger face off a black bear over some food in a garbage dumb. The bear tried to get in again and again and eventually got chased away by the much smaller badger. Tsisheró:hen speaks to to the true Warrior in each us. Not she who wins every fight or cares about winning at all, but she who will not surrender, who will get back up no matter how often she is knocked down, she who can be fierce when she needs to be fierce. Badger digs down deep in the earth, into the dark places where the roots of all things live and makes her home there. She is far larger than her body. There is a Warrior, there is Tsisheró:hen in each and every one of us. She may seem ttoo small to matter. But she is there, and she is as ferocious as she needs to be. Know that Tsisheró:hen is there. Know that the Warrior is there. And she is ready when you need her. Thank you for your explanation of Badger, Jules. I am on a journey to know my ancestors, and saw a badger this morning in my mind’s eye. I appreciate that you shared your understanding. Thank you. I had a dream of being attacked by a badger from a long distance away. I saw it coming from about 50 yards away. I started running and as I glanced back to see it was gaining on me, I decided to stop running and turn to just face the attack. I waited for it to get close enough and then it leaped in the air towards me. It latched on to my skin and I began pressing it’s jaw harder into my skin so that it couldn’t bite down and pull out a huge chunk. I do not know who won the fight as the scene ended there. Very odd dream for me. I’ve never dreamed of being attacked by an animal before. I’m very fond of Badger for her courage and massive heart. I once watched a Badger face off a black bear over some food in a garbage dumb. The bear tried to get in again and again and eventually got chased away by the much smaller badger. I have a jade pendant with a badger afixed to a gourd. I’ve also seen this variation especially on jade pieces; i.e., scupltures, etc. can you tell me what it means in symbolism? I went on a journey recently to find my spirit animal. The last animal I expected to meet was a badger but he came to me straight away. I was really surprised and even tried to tell myself I was mistaken but there was no doubt he was connected to me. Appreciate your information on the badger, who is often overlooked. Great job.